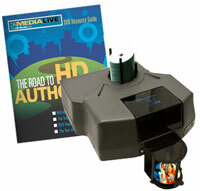 The CX-1 Disc Publisher was recently reviewed by Jan Ozer at EMedia Live, and received rave remarks. The CX-1 was introduced along with the print-only PF-3 Print Factory in October and has achieved critical acclaim within the industry. Ozer made plenty of encouraging notes and observations in testing the CX-1, some of which are highlighted below.